This is bullet-proof human skin - made from spider silk and goat milk. Yes, really. Once the goats are milked, Essaidi spins the protein into fiber that is ten times stronger than steel, and mixes it with human skin. Basically she's created a fiber matrix of the protein, laced liberally with human skin cells. 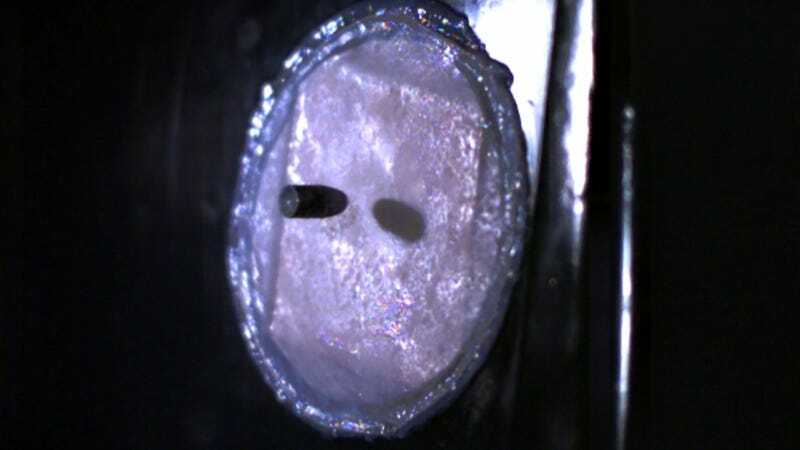 The result is a composite of human skin that can actually stop bullets, as you can see in this picture below. The project is called '2.6g 329m/s' after the weight and the velocity of a .22 calibre long rifle bullet. The ultimate goal of the project is to create bullet proof humans by replacing the keratin in our skin with spider's silk, making it much tougher. The current project, though, is a more modest endeavor. The outer and the inner layer of skin will grow around a matrix of spider's silk, making an overall composition that is bullet proof. You can see the whole project (with narration in Dutch) in this video. Via Jalila Essaidi and Naturalis.